Hancock here AGAIN. The Eagles are still coming!! 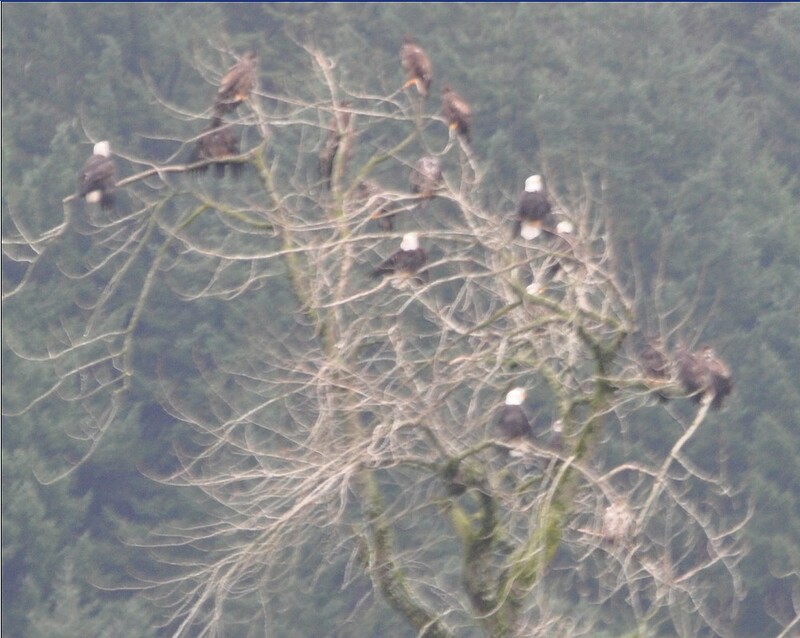 Today, Saturday Dec. 11, 2010, was an incredible day of bald eagle watching. By noon there were still more than 6000 eagles on the flats feeding, in the surrounding trees and flying overhead. It was a truly wondrous site – something few living humans have ever witnessed before. 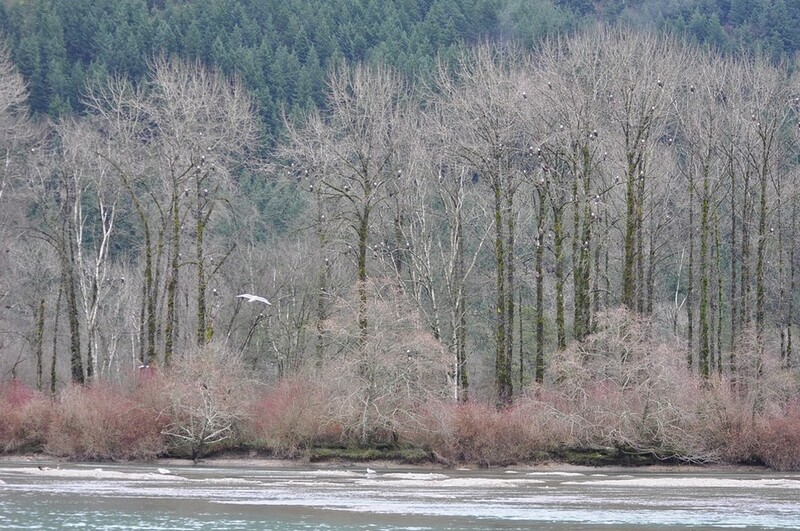 Why are more bald eagles gathered and still daily increasing in numbers along the Chehalis – Harrison River complex? The simple answer is that the Harrison system is having a reasonably good return of spawning salmon and a major number of the northern and mid-coast rivers of British Columbia, where normally the eagles would be feeding, have had devastatingly low salmon returns and the eagles have come here by default. Normally the northern and mid coastal rivers freeze up and force the eagles south. 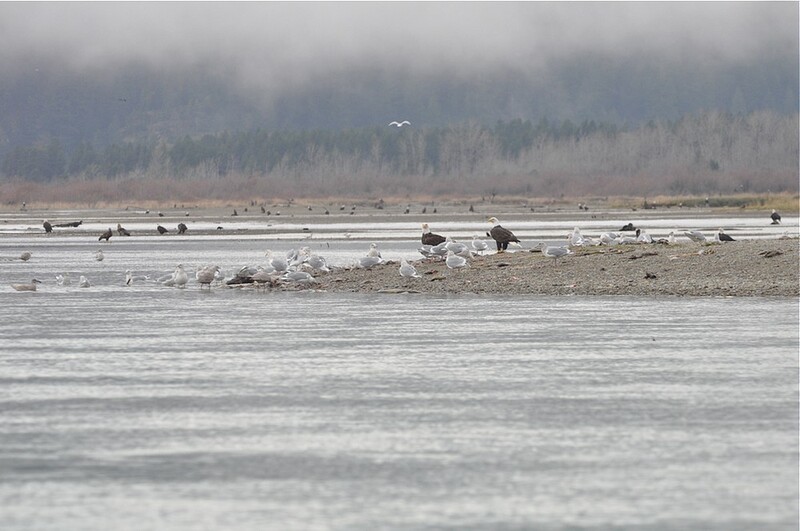 This year there were few spawning salmon returning to these rivers so the eagles are coming south early in desperation. This may become a very stressful circumstance for eagles in the coming weeks when the Harrison runs are eaten up or washed into the deep water by seasonal floods. When the carcasses are gone the eagles will have to disperse further to look for food. I predict this year will be a record year for eagles appearing to the East. I suspect we will soon be having reports of larger numbers of eagles showing up along the inter-mountain water ways and particularly along the associated Mississippi waterways. Our eagles can readily fly 300 to 500 miles a day in their search for dinner. 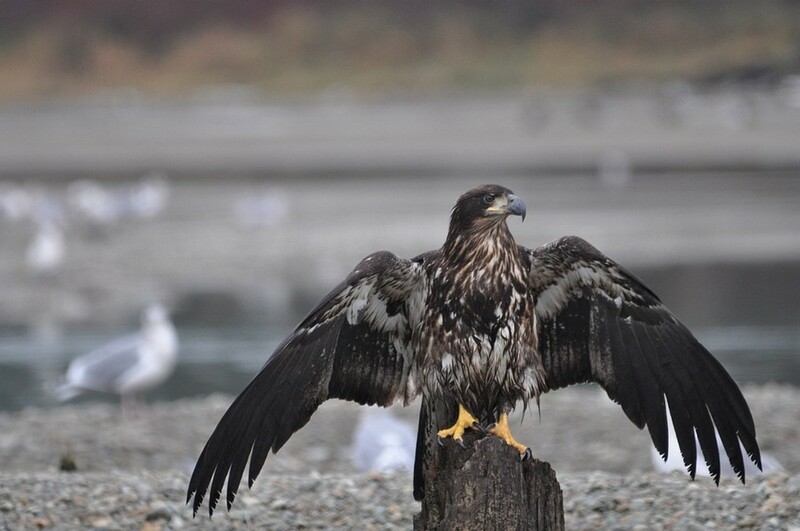 This is going to place eagles a long way from their traditional west coast salmon rivers. 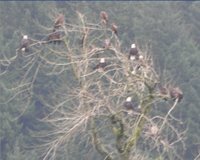 In the meantime, if you want to see the world’s largest collection of eagles, come to the Chehalis – Harrison River confluence. We are going to run another tour Saturday, 18th of December, from Kilby. 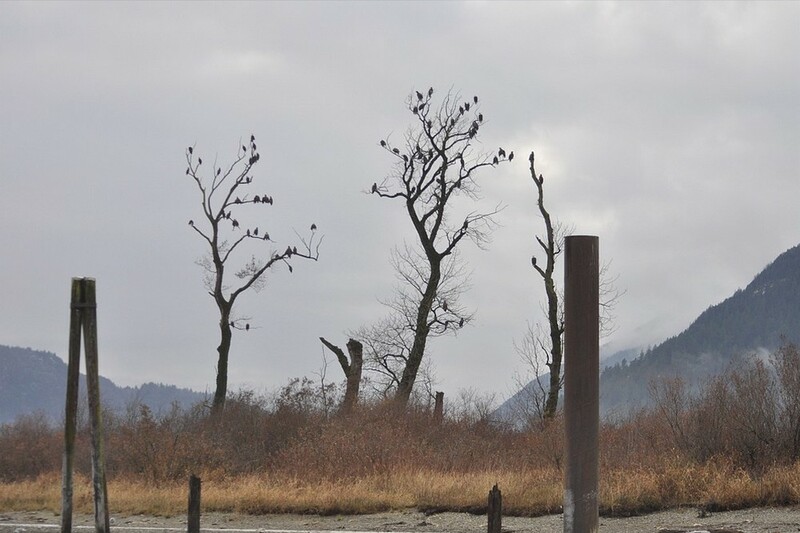 Call Jo-Anne of Fraser River Safari Tours, 604-825-7361 or 1-866-348-6877, for a booking. I will be along for commentary — and enjoyment!! Note on Images: I hurriedly took a few shots on Saturday to show some birds. 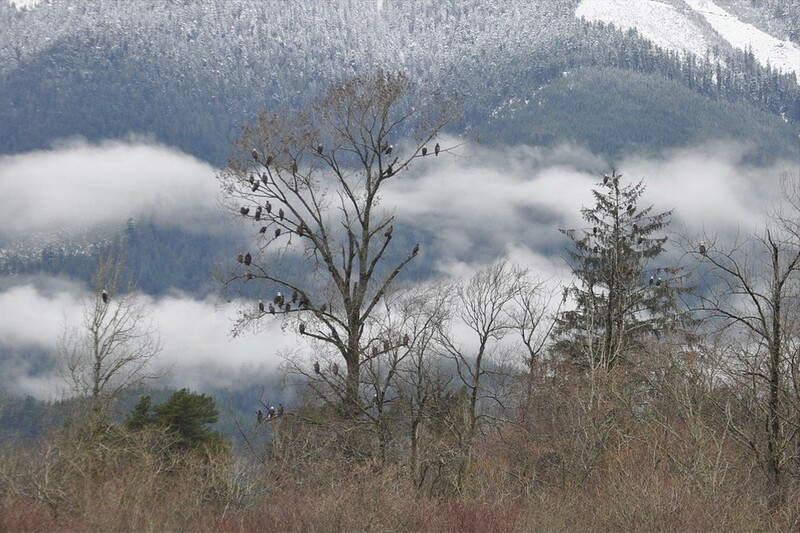 The surrounding trees are filled with the “golf ball heads” of the adults, However they represent about 40 to 60 percent of most gatherings of eagles. In the blurry close up you can pick 7 adults and 11 juveniles in one shot. The ‘droopy wing-down’ position is indicative of a bird drying out after a heavy rain or swimming or dragging a salmon carcass to shore. Click on pictures to See the original size.